A new report shows that more than 50 percent of the Gen Z demographic—the largest generation in the U.S.—is interested in pursuing a career in hospitality. Coinciding with National Apprenticeship Week, the findings support the hospitality industry’s job training and apprenticeship programs that facilitate employees to move up the ladder of opportunity. Research shows that Gen Z has an average attention span of eight seconds, compared to 12 seconds of millennials. “We better catch them fast,” added Maietta. 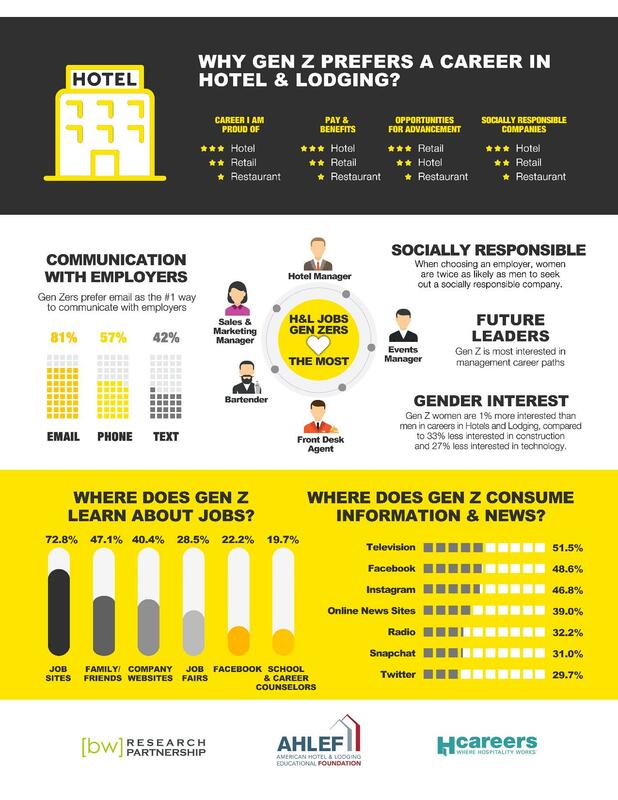 The survey found stark differences between male and female Gen Z respondents. Already a highly socially inclusive generation, when choosing an employer, Gen Z women are twice as likely as men to list a socially responsible company as the most important factor when choosing their job. The top traits found to be important to a Gen Z’s success at work include good attitude, confidence and team work for females, compared to technical skills for males. The Hotel and Lodging industry attracts higher interest from Gen Z and young millennials than industries such as construction, finance, insurance, restaurant and food services. It’s also the one thing men and women can agree on – the industry attracts interest from both males (52 percent) and females (53 percent), bonus for recruiters in the field. The survey revealed a majority of Gen Z (52.5 percent) respondents do not believe education is a top characteristic necessary to qualify for a job. Attitude, confidence, ability to work in a team, and technical or job-specific skills are more important, according to Gen Z respondents. The study was conducted online through a BW Research survey to a national panel of 15 to 30-year-old individuals via email and mobile phone. Designed to be representative of the U.S. general population, quotas were developed using population estimates provided by the U.S. Census Bureau. Representation was maintained for age, gender, ethnicity and race. It was completed by 2,846 respondents with an average completion length of just over 16 minutes. In this study, Gen Z is defined as individuals between the ages of 15 and 23, and young millennials are defined between the ages of 24 and 30. A downloadable copy of the report is available here. For more information on the study, plus career development resources and information on apprenticeship programs, visit AHLEF.org.